July is almost over, and most of us are busy packing as much life and enjoyment as possible into the remaining weeks of summer. 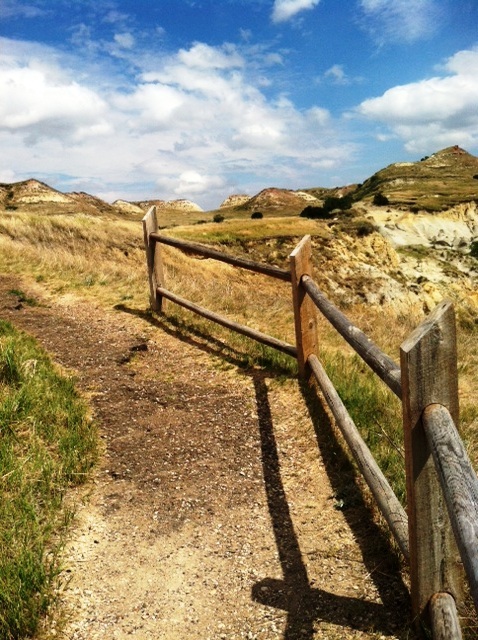 It had been a while since I had been through the Theodore Roosevelt National Park; in fact, it had been much too long. I didn’t want to miss the chance to enjoy the park in its summer glory. Even though I only had about an hour and a half to spend there around other items on my schedule, I decided to go for a quick drive through the loop. Grasses wave and clouds swirl on a July afternoon in TR National Park. I have always felt that TRNP is one of the “best kept secrets” of the national park system. Beautiful, clean, and never crowded, it’s the perfect afternoon drive if you want to clear your mind and fill up your senses. The 36-mile paved loop road winds lazily around hills and past creek beds, under tree branches, sometimes with only a handful of other cars in sight. Although early mornings and evenings are the best time to try to catch a glimpse of the park wildlife during the heat of summer, I was hoping I’d luck out and stumble across some animals in the afternoon sun. Prairie dogs are a given – you will inevitably spot those little guys popping out of their ground holes, sitting up to assess your vehicle, barking out a greeting to a neighboring dog, and just as quickly darting back down inside. Pathway along Wind Canyon in TR National Park. 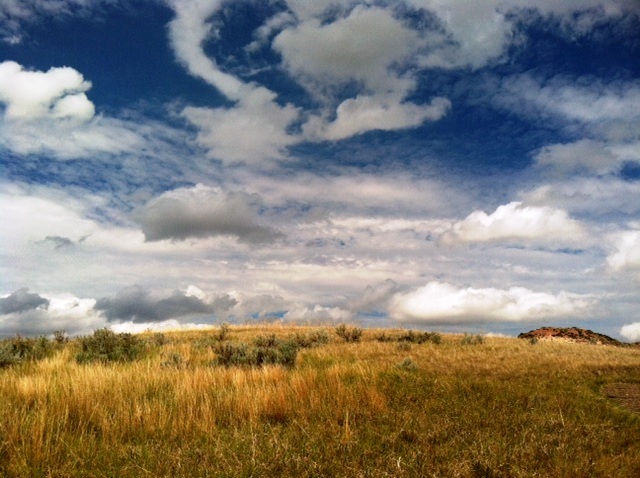 After enjoying the prairie dog town, I was taken in by colors. Mid-summer is the time of year when grasses start to dry out and add shades of light greens, yellows, and browns to the never-changing scoria reds and cedar greens of the badlands. The view from Wind Canyon was, as always, breathtaking, with occasional clouds threatening sprinkles and adding grays and navies to the summer blue sky. Some buffalo kick up a little dust in TR National Park. Some wild horses posed on the horizon from a distance, but not close enough to get a good look. 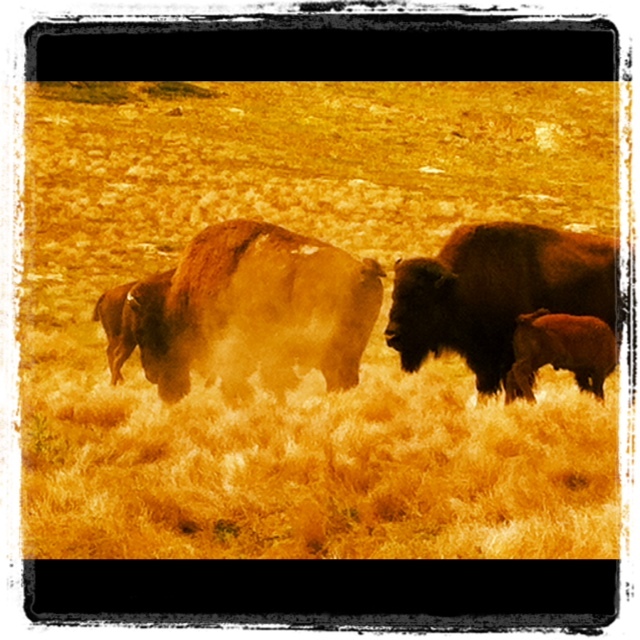 Then I turned a corner around a butte, and was greeted by a buffalo herd roadblock! Mothers with their calves grazed on the grass or rested on their sides. A couple of the furry beasts got in a scuffle and kicked up a little dust in their wake while the others ignored their horseplay. 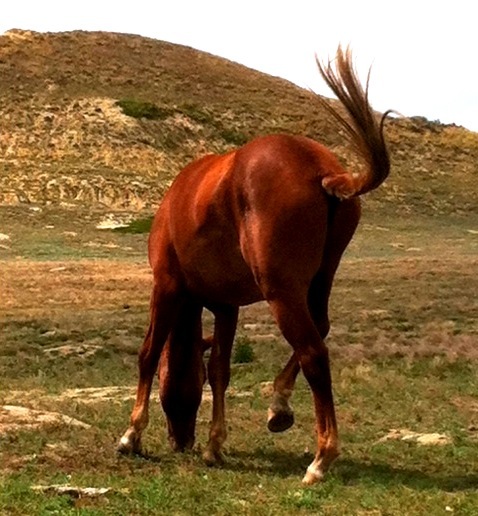 A wild horse gets frisky in TR National Park. The oddball in the herd was a lone wild horse, who was busy doing some heel-kicking on its own! The drive was over before I knew it, but the vivid landscape and surprising wildlife left me wanting more time in the park. Resolved to make it a more regular stop on my summer calendar, I challenge you to do the same as you venture to Medora! Thanks for refreshing my memories of TRNP…was there this June…was able to drive through a couple of times and loved every minute!